Basketball referee procedure at spot of foul. Today we'll be covering something that is absolutely essential for new officials: Basketball referee procedure at spot of foul. If you are a new(er) official I'm fairly confident that you have been told you need to slow down. A common problem an issue for new officials is being in too much of a hurry in general, but specifically at the spot of the foul. As a new official you don't want to be in that position where you are doing the "look back." You've made a great call. You're 100 percent. You start for the table to report your foul and you realize you don't know you don't know who your fouler was or worse yet you guess and put the foul on the wrong player. When you have to look back you create that moment of perception by everybody observing (coaches, players etc) that you are indecisive. We want to eliminate that. You are decisive and you want to show that so here it'd be. At A Better Official we constantly preach to understand and implement what's in the officials. B) At the point of the foul, it is imperative that a definite procedure in officiating mechanics be used when a foul occurs. Let's understand what the word imperative means. This is the only time the word imperative is used in the officials manual. The word imperative, let's look at the meaning: of vital importance; crucial. Look at the synonyms all-important, vital, crucial, essential, indispensable, urgent. So let's pay attention to what officials manual says is imperative to do at the spot of the foul. 1. Inform the timer and alert the scorer by sounding the whistle with a single sharp blast. While raising one hand fists clenched straight and high above the head. 3. While holding the foul signal move toward the play and near the fouling player. Stop and verbally inform the player that he or she fouled by stating the jersey color and number. 7. If basket has been scored signal to count as soon as it is legally scored. If a try attempt is not to be awarded whether or not the attempt is good immediately wipe off the attempt with the appropriate signal. 8. Do not be in a rush to leave the play area if players are in close proximity or on the ground. Attend to the dead ball situation at the point of the play before leaving to report to the table. 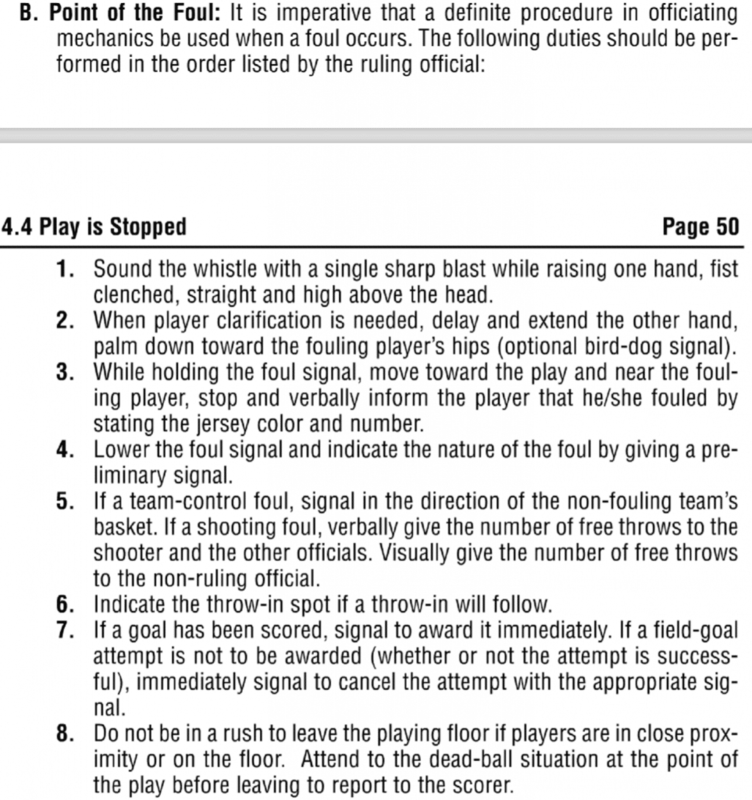 We've covered what the mechanics manual explicitly lays out about Basketball referee procedure at spot of foul. now your job is to go ahead and implement that. Our strong recommendation is to learn to state at the spot of the foul the color and number of the fouler. This imprints it in your mind it makes it so easy to go to the table with that at the top of your mind. You will never again face a situation where you're looking back. If you've got black 23 at the spot you're gonna have black 23 at the table. Free Throw Positioning as Trail. 2-person. 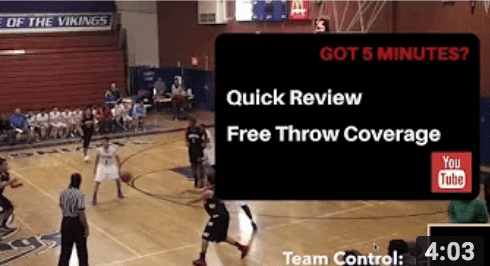 With the NFHS focusing on protecting the free-throw shooter during throws, even more is piled on the plate of the Trail in 2-person mechanics.